Are you FRF (Fire Rescue Fit)? We all may answer that question differently. The reason behind that question though is simple… Are you ready for the demands of the day, of the job, of the tasks that you must do as a fire rescue athlete? Sometimes our fitness gets away from us and we may not even realize it. So, today, I wanted to give you a workout that has a twofold purpose. First, its a very efficient workout that you can literally do anywhere and it will help you get “fit for duty.” Second, its a great way to measure you current level of fitness and motivate you to improve it. 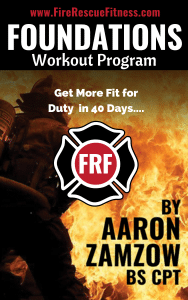 Discover the FRF Foundations Workout Program trusted and used by thousands of Firefighters to get stronger, lose weight and get back in shape. Efficient and effective resistance training options including 5 challenge workouts. There are also 4 different cardio workout options that you can customize to your specific goals.